The introduction of a purchase preference policy for iso 14000 certified companies in the draft national environment policy is a questionable procedure (iso 14000 is a global standard of environment management). The Union ministry of environment & forests (moef) feels the move will clean up the supply chain and improve environment management of industry. Instead, the policy might get the corporates swarming around for certification merely to benefit from the new add-on. The BIS For International Organization for Standardisation (iso) certifications in India, the Bureau of Indian Standards (bis) is the official agency that issues certification. As iso 14000 is about corporate environment standards, this includes design and identification of environment aspects, developing an environment policy and identifying relevant legal and regulatory requirements as well as aspects such as training and documentation. The certification process involves application, pre-certification auditing and issuing of certification for a fixed period. bis has given iso 14000 certification to about 79 companies. However, bis is not the only option companies can turn to. Given the huge potential, a number of global certifiers (franchises of their parent companies) have also entered the fray and are doing business with Indian companies. But such a dispersion, over several agencies, could create new problems of reliability. "The problem with these certifying bodies is that they have accreditation certificates, but their parent body does not check their functioning. At least 30 such franchise-certifying bodies exist in India," says Girdhar J Gyani, Secretary General, Quality Council India (qci), Delhi. Companies obtain certification from these bodies without having to implement the norms. Then again, "The company can choose to mitigate an environmental aspect it can control and ignore the rest. There is no public disclosure on environmental aspects except the area of policy," says Mainak Hazra, Senes Consultancy, Delhi. The procurement process is also pure routine: "Getting an iso 1 4000 certification is certainly not difficult," says Rajiv Bhatnagar of Aditya Cements. iso certification is valid for three years, during which the certifying body has to conduct surveillance every 6 months or at least once a year. But "Nowadays certifying bodies do not bother to conduct even surveillance audits; they are more interested in money," says Gyani. 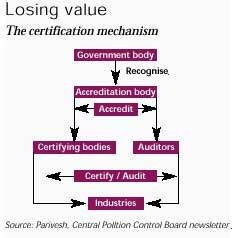 Another operating factor is the cost of certification. The count starts at one lakh. "To provide certification and conduct audits, bis charges the lowest amount", says R K Singh of bis. Certifying bodies accredited by foreign agencies cost more. Consultants charge anywhere between one to five lakh, depending on the size of company and on the scale of operation. The purpose of iso 14000 is to make companies more environmentally sound But its growing commercialisation threatens to put all such good intentions on the backburner: the certification is a tiger rapidly losing teeth.